Jill Griffin & Ben Fein are meant to be together…said no one ever! Jill has built a successful career writing romantic ballads for many of today’s top performers. Since the tragic end of her marriage a couple years back, the 40-something single mom has all but abandoned hope for a love story of her own. Ben is a brash, young boy-band singer seeking a solo career who hires Jill to write for him. He’s got a dark secret from his past that he wants to keep hidden. The attraction between the two is red-hot and when Ben falls hard for Jill, he doesn’t care who knows it. Jill’s been burned before and wants to take things slow, keeping their relationship out of the glare of the media. After a gossip columnist exposes their affair, she’s forced to decide if she can risk letting go of her past in order to build a life with Ben. When Ben’s past makes headlines, Jill begins to wonder how well she really knows him. But as Ben climbs to the top of the pop charts, he’s determined to succeed… at convincing Jill to take a second chance on love. 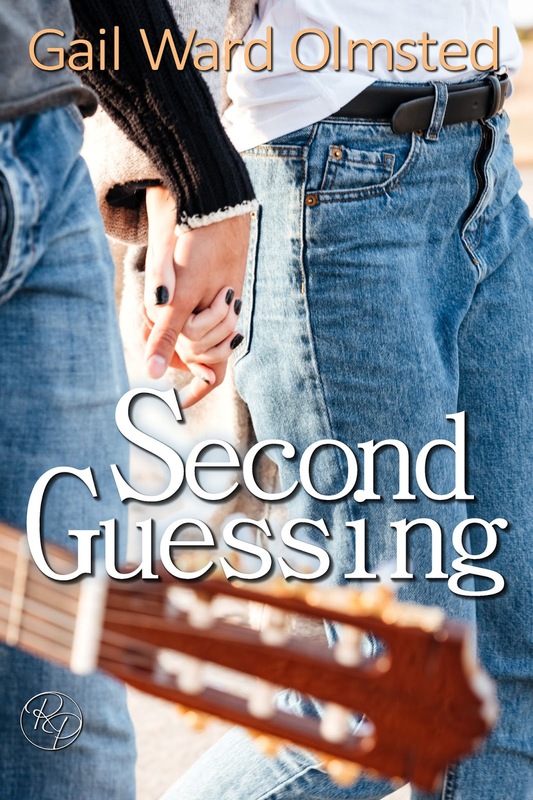 Second Guessing is the love story of Jill and Ben, who are so wrong for each other that they may actually be right! Ben popped a dumpling into his mouth and chewed and they grinned at each other happily. They managed to make short work of the appetizers and Jill moaned with pleasure as, after removing the empty plates, their server replaced them with huge bowls of pork fried rice, shrimp lo mein and chicken in a garlicky sauce. Their dinner was served family style, and Jill helped herself to large portions of everything. They ate in companionable silence, punctuated by Jill’s moans of delight as she sampled each dish. After she had eaten most of the food she had taken, she drank some water, and then sat back with a satisfied sigh.“Carly says I could have a food baby and no one would even notice.” God, where had that come from? Jill shrugged her shoulders. Always shy and intensely private, she had grown increasingly wary over the years and disliked talking about herself. She had been burned a few times by those claiming to be interested in her, when all the while they only wanted to learn something about James, as if she would relay some juicy bit of gossip about him, posthumously or not. She knew that since Ben was well on his way to the level of celebrity James had enjoyed, it was highly unlikely Ben had any kind of ulterior motive. He was probably sincere in wanting to get better acquainted with her. But even though she felt comfortable with Ben, she was out of practice with any sort of personal narrative. “Well, that’s all there is to me, I’m afraid.” Jill laughed nervously. Ben was shaking his head at her. “I think you’re wrong. I see so much more than that. I see a beautiful woman. A talented woman. A woman I want to get to know much, much better.” Jill put down the cloth napkin she had been folding and unfolding underneath the table. She had regained some of her self-confidence and she watched him closely as she spoke. “A mature woman. Ben, I’m 42 years old. I have an 18-year old daughter. I don’t know what you want from me. I’m not a ‘Mrs. Robinson’ okay? You’re so…young,” she ended weakly. But Ben was not to be put off. “I like you Jill. Yeah, I’m a little younger than you, but so what? Just a number, am I right? I want to know what makes you tick. How you come up with all those amazing song lyrics. What you love, what you wish for. And more than anything, I want to know how it will feel to hold you in my arms. What it will be like to kiss those lips. What you taste like…” He stopped as he noticed Jill was staring at him, open-mouthed. He pushed his chair back and slipped over next to her in the banquette. Jill needed to say something, before she started kissing him like she had been dreaming about all day. Ben was watching her closely and at his nod of agreement, she continued. My first visit to Sedona, AZ prompted me to start writing JEEP TOUR, my first novel. I fell in love with the red rocks and blue skies and I couldn’t imagine a better place for a do-over. Second Guessing is my fourth novel and the theme of second chances and fresh starts has stayed with me. A hopeless romantic, I am married to the love of my life. I am mom to two young adults and two crazy cats, and I enjoy reading, boating, music and travel.I am a professor of marketing in the School of Business & Information Technology at Springfield Technical Community College in Springfield, MA. I was the recipient of the Deliso Endowed Chair Award and was recognized by the Commonwealth of Massachusetts’s Department of Higher Education as one of “29 Who Shine”.